The current setback in the reform project and the deterioration of Bahrain’s image abroad due to human rights violations has disappointed everyone, including the King and the Crown Prince. The crisis was the result of dominant extremist discourse, sectarian feelings and the influence of the demonstrators on the political decisions. The King and the Crown Prince had attempted to initiate dialogue as a solution to the problem in order to curb feelings on the street and achieve stability and the rule of law with minimal losses. Unfortunately, this dialogue did not succeed due to the tense atmosphere in the country and widespread sectarian feelings. It is clear that the Government has realized the faults and negative effects in applying security measures, which raised concerns among Bahrain’s friends abroad. Both the King and the Crown prince have attempted to restore order and solve existing problems by embarking on a series of corrective steps including affirming the rule of law, confronting violations, and returning once again to the reform project. It also include promoting human rights and fundamental freedoms and initiating national dialogue as a crucial step towards solving the country’s political crisis. His Majesty the King, 31/5/2011: ‘we should only pause at what we have recently been through to learn lessons from it. The reform project was first initiated on the basis of a historical consensus on the National Action Charter where Bahraini citizens decided to start a new chapter in their history. This included a comprehensive modernization program and attention to providing a dignified living for all, whilst promoting public representation and participation in decision-making and developing the present and future for generations of Bahrainis. Reform is the project that we have not and will not flinch from; it is the faith and the will between us and the people. Who does not want a more efficient government performance? Who does not want a more effective legislative representation? Or political associations and civil society groups that work in the framework of national unity and the rule of law? Anyone who rejects this does not believe in development and will be unable to stop the natural progress of people. Dialogue is a strategic choice in order to reach solutions. We call upon both the Legislative and Executive authorities to call for a national reconciliation dialogue regarding the ideal situation for the Kingdom of Bahrain and to take all the necessary procedures to prepare for this comprehensive and serious dialogue without preconditions. Dialogue should start in July and everyone should participate in order to push reform forward and to achieve more development in all fields as well as participating in strengthening the foundations of the reform project’. The Prime Minister Khalifa bin Salman, 5/6/2011: called upon all parties to participate positively in the Kings’ comprehensive national dialogue and to present their proposals for the country’s interest. He also encouraged all parties to persevere in the dialogue and work hard into making it a success because it is the safe way out of the crisis and will lay the foundation for the new period. His Highness the Crown Prince, after his meeting with the British Foreign Secretary on 25/05/2011, stated that: (there is great activity to deal comprehensively with issues of fundamental concern at the national and international levels, as our goal is to build on the historical process of development and reform, which is clear and evident when we look at it from a wide regional perspective. The Kingdom of Bahrain is fully committed to the continuing reform within the framework of the reform project led by His Majesty the King Hamad bin Isa Al Khalifa. The progress in this project depends on reconciliation, stability, sustainability and responsibility, coupled with the development of realistic goals, which are achievable and acceptable to all Bahrainis. Bahrain was able to overcome the difficulties in the past, and will be able to do that again as a united country under the leadership of His Majesty the King. The unfortunate events that took place were different in nature, and came as a result of rejection by one party of the initiative of His Majesty the King to begin a comprehensive national dialogue, which I was honoured and entrusted by His Majesty the King to carry out. This rejection affected the Bahraini society, caused unacceptable polarization, and gave way for the militants to create turmoil and violence, which necessitated the application of the National Safety Law to prevent escalation of the situation and the occurrence of clashes that divide the community). The Crown Prince after his meeting with the British Foreign Secretary, 25/5/2011: ‘I welcome the support of President Obama and his understanding with regards to the national dialogue. I also welcome his comments on the required conditions for the success of the dialogue. I completely share the President’s views that international rights treaties should be respected and that Bahrain should continue its serious reform process, which is a priority in the Kingdom. The United States is a historical ally of a country which is about to engage in new phase of reform. Bahrain’s continued commitment to the reform project which was initiated by the King a decade ago will not change. The announcements made by various political parties in the Kingdom welcoming dialogue is an important indicator that democratic development in Bahrain is continuing. However, this development must go hand in hand with stability and must be based on consensus. The reform process is not an easy and will face many obstacles, including tackling the issues that divided the Bahraini society and led to society polarization. Bahrain is learning lessons from the recent events, and has undertaken steps to guarantee a better future; we have decided to go forward with more reforms’. 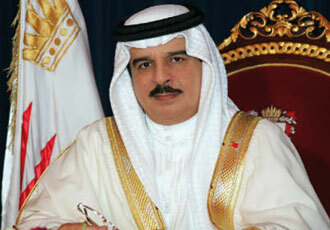 The Crown Prince, 4/6/2011: His Royal Highness the Crown Prince affirmed that Bahrain is steadily moving towards a new era due to the efforts to enhance the democratic gains of the country, which are continuing through the reform project led by His Majesty King Hamad bin Isa Al Khalifa. In a meeting with the SG of the UN, Ban Ki-moon on 3 June 2011, His Royal Highness also underlined the commitment of the Kingdom of Bahrain to a comprehensive national dialogue called for by His Majesty the King to reach a consensus among all segments of society through democratic bodies. His Royal Highness added that this would reinforce national unity and maintain stability. His Royal Highness also emphasized the solid belief and commitment of the Kingdom of Bahrain to human rights principles and respect for basic freedoms, such as those of assembly and opinion within the framework of legitimacy, law and the constitution. 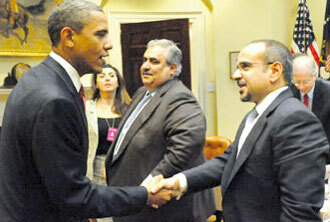 After meeting the President of the United States, the Crown Prince stressed on 7/6/2011 that “Obama’s support and understanding regarding Bahrain’s forthcoming national dialogue was most welcome, as were his comments on the circumstances required to ensure its success,”. 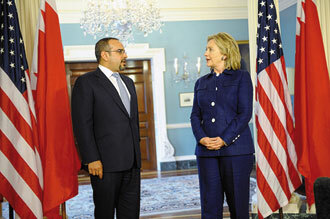 The Crown Prince after meeting with Secretary of State Hilary Clinton, 7/6/2011: “It is a great pleasure to be here. I am honoured to be here as a representative of my country during this challenging time. It is a great test, but also a great opportunity to lead the nation forward. We are committed to reform in the political and economic areas, and I reaffirm our position to work with the US to achieve that. The Crown Prince, 8/6/2011: “in order to guarantee the success of dialogue, both the participation and the agreement of all parties is required, in addition to the determination of all Bahraini people to remain united and moderate”. His Excellency the Foreign Minister Sheikh Khalid bin Ahmed Al- Khalifa, in an interview with PBS News Hour: “Bahrain is currently considering the release of some detainees. Our Government is not looking for a government-opposition dialogue, we are instead working towards a government that aims for a comprehensive reconciliation for our people.” The Minister also commented on the statements made by the UN High Commissioner for Human Rights, in which she described the security measures in Bahrain as harsh and she called for investigation by international institutions: “we pay attention to everything been said, and do not claim that these statements are untrue. Undoubtedly, we see and hear many exaggerations, but we are not angels, and are trying to see the bigger picture. If there had been any mistakes, we will ensure that they are duly corrected”. 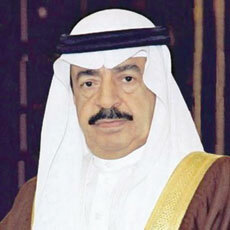 His Excellency the Foreign Minister, 2/6/20011, said that Bahrain is committed to the national dialogue announced by His Majesty the King and to international human rights standards. He added that Bahrain aims to implement such standards, encouraged the private sector to reinstate dismissed workers, formed a ministerial complaints committee to investigate redundancy cases and released many accused of various cases. He also affirmed that Bahrain is willing to develop its democratic experience, stressing at the same time that national dialogue in the context of democratic institutions is enough to fulfill citizens’ aspirations. 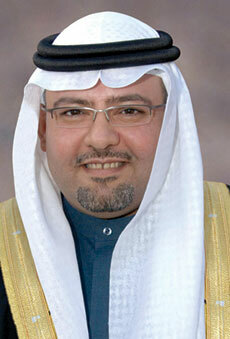 He also added that Bahrain is working to calm sectarian tensions in order to prepare for national dialogue. The Minister also stressed that Bahrain will continue to promote human rights, and is currently cooperating with all human rights institutions as it is committed to international human rights conventions”. The Minister of Justice in a press interview, 2 June 2011: “His Majesty the King desires that all Bahrainis participate positively and effectively in the dialogue, and that recent events will not affect mutual relations between Bahrainis and the ways in which they debate with each other. Dialogue should not be hijacked by inciting people to take to the streets as this can only lead to social polarization. Everyone has felt the pain of recent events and we do not want to go back to it. We would also like to stress that the doors are still open for a dialogue which is based on national consensus. We should concentrate on how we want to see Bahrain after this crisis and in the coming phase we will witness major changes and wide and transparent debates which will provide an opportunity for the people to end their suffering and emerge with a more mature experience”. The Minister of Justice, 2 June 2011: The Ministry of Justice and Islamic Affairs announced a month before the speech of the US President that it would rebuild places of worships as part of its development plan: “this is not a reaction to international statements. We are fully aware of our country’s needs, including the need to establish places of worship appropriately”. Deputy Prime Minister Jawad bin Salem Al-Areed and the Chairman of the Committee formed to consider the events that have occurred since 14 February 2011 (on 8/6/2011): the committee meetings will continue during the next period in order to ascertain the reasons and circumstances which resulted in the deaths of a number of citizens and residents during recent events. The Minister of Labour, 11/5/2011: “the door is open for anyone who has evidence proving his/her dismissal to be arbitrary, and the Complaints Committee is following dismissal cases which have currently been registered with the Ministry. Many companies have already formed their own committees to reinvestigate and verify the legal procedures of dismissals, and have allowed their employees the right to file complaints according to the law. The Ministry expects more companies to reconsider their dismissal procedures, especially those which have violated regulations, and to reinstate individuals who were unfairly made redundant. During the upcoming period, the Committee will verify companies’ documents and the procedures, which led to their dismissal decisions. What is most important for the Committee is to provide all possible legal guarantees for those dismissed and not to violate their rights, which are laid out in the Kingdom’s law and regulations”. The Minister of Labour, 26/5/2011 affirmed that unemployment insurance will be paid out to anyone proven to be arbitrarily dismissed during the regrettable events. He added that all companies are in the process of revising their procedures with the coordination of the newly formed Committee. He noted that mistakes were made in this regard which can be corrected. The Ministry of Municipalities 25/5/2011: in response to published articles on the demolition of some worship premises, the Ministry affirmed that demolishing unlicensed constructions was part of the Ministry’s responsibility to ensure that all buildings are in line with development regulations. The Ministry strongly denies causing any unnecessary damage, adding that the demolitions were conducted in order to organise streets and neighbourhoods, to improve the appearance of the area and to prevent the hindering of some infrastructure projects. The Ministry also denied any claims that it was targeting places of worships, stressing that such allegations are untrue and stir public opinion. The Ministry said that only the unlicensed parts of the places of worships were removed and that the Ministry has photographs and documents to prove this.